Best Gym In Norwich - Phoenix Feels Good Like a Gym Should! Phoenix Gym in Norwich opened back in August 2013 and has gone from strength to strength to become “The Best Gym in Norwich! 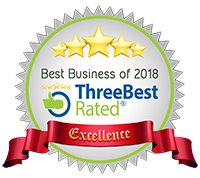 Rated by the prestigious “Three Best Rated” who focus their attention on the BEST businesses in each city rather than the “biggest Brand” or “most of” and uses a thorough “50 point inspection process” to find and rank the 3 top businesses, professionals and health care providers in each city. They take into account such things as reputation, history, complaints, ratings, satisfaction, trust, cost, reviews and excellence. Phoenix Gym rose from the ashes of a previously failed gym business on Oak St in Norwich, just off the inner ring road. The new owners did not initially have a huge budget to throw into the business, so they focused on the most important thing, the member experience! Five years on and they have so far invested over £300k into the equipment and refurbishments making significant improvements to the internal decor, changing facilities and introduced ample FREE parking spaces for their members. There have been hundreds of improvements thus far and the transformation is quite unbelievable! But Phoenix Gym members will all say the same thing, that the best thing about Phoenix is “the atmosphere”. Everyone from the staff to the other members are so friendly and welcoming that you just feel instantly at ease. People actually say hello, happily share equipment and take interest in your results. It’s not like your typical corporate gym where nobody talks to each other and people are on their phones, posing or being pretentious like a fashion parade and it’s not like a lot of smaller private gyms where it’s “clicky” or intimidating. There is no pressure to look good or be fake, you can just be yourself and focus on your training with “good vibes” around you. Phoenix introduced a range of free classes for their members in December 2018 including bootcamps, Function Fit and boxing Fit. New classes are now being being planned for 2019 very and the timetable will be updated regularly. “Function Fit” is a Fun, Unique full body workout that provides exercise progression for improvement similar to CrossFit. “Boxing Fit” is an action packed boxing workout in a fully kitted out boxing studio and “A Fit Body Bootcamp” is an all over strength, tonight, fitness and conditioning workout that is great for fat loss and fitness improvement. 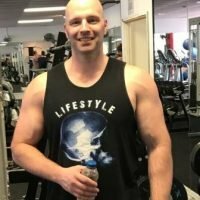 When deciding on the value of a gym membership most people think “how often would I us it” and therefore is the cost worth the usage? You also have to factor in convenience, opening hours, equipment and facilities provided including parking which can impact all of the above. When looking at usage stats for most gyms with large membership numbers you can quickly work out that less that 50% of their membership actually use the gym on a regular basis and around 10-15% of members quit every month! At Phoenix we have over a 90% usage rate and only 4% attrition rate so what does that mean? It means that you are twice as likely to actually go to the gym and 3 times less likely to quit on your goals by working out at Phoenix Gym! There is no point paying for a swanky pool or only paying £18pm if you don’t actually go to the gym to get your monies worth. Is there? Equipment quality and variety is so important to motivation. Good quality equipment is a pleasure to use, it helps you feel the muscles your working which can be really motivational and having more than one way to exercise a certain muscle group of movement prevents you from getting bored from doing the same thing over and over again. People say that the hardest part of the gym is actually getting there and the “getting there” part is determined on what equipment you have and how it is played out! Since our latest 2 refurbishments we have seen spikes in our members usage rates and they all say the same thing. We really look forward to going to the gym now no two workouts are the same because there is so much variety on what we can use. This prevents boredom and keep motivation high! Phoenix has pin assisted machines, free weights plus a large selection of plate loaded equipment which allows you to make smaller incremental weight increases for women and use larger weights than a basic machine is limited to for guys. 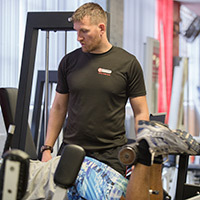 Most people hate training their legs but leg training is so important for posture and results so Phoenix has a great selection for leg training. You can join Phoenix Gym in Norwich online or simply walk in anytime to be greeted by a member of the team. The staff will quickly get to know your name, and there is always at least one member of staff available to help throughout the day. 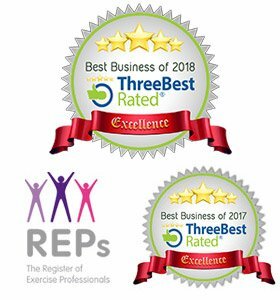 You get 2 x free 1-hour personal training sessions to get you set up with a personalised programme as well as a welcome pack with various vouchers to take advantage of the in-house Phoenix services like supplement orders, massage or an impressively detailed Bodystat body composition test! 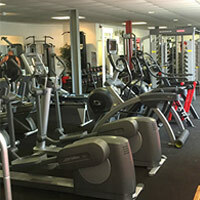 The Norwich Gym is spread across three large rooms of over 10,000 square foot, housing six different training zones. The first room is a multi-use room that is laid out to be very non-intimidating having everything you need for general fitness, toning, mobility, and strength. The second room is a combination of plate loaded upper body equipment, free weight benches, dumbbells, barbells as well as two half racks with integrated lifting platforms. 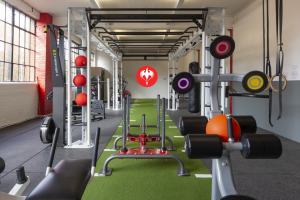 The third room has a plate loaded and machine-based leg training section, another half rack, a full-size lifting platform, a competition standard powerlifting station, astroturf with a sled, strongman equipment, soft plyometric boxes and a dedicated boxing and MMA zone. There really is something for everyone here! 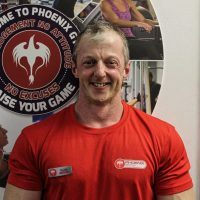 Phoenix has a very experienced team of Personal Trainers who all specialise in different areas of training from powerlifting, bodybuilding, weight loss, sports conditioning , Nutritional Advice, and boxing or martial arts training. Phoenix also has a fully equipped private personal training studio for clients who may prefer a more personal setting or to perform more complex types of exercise more efficiently such as circuit training using multiple stations at once, which is difficult to do in a busier main gym. Phoenix has big plans for the future so watch this space and why not pop down for a free gym tour or contact here to ask us any questions and to experience what “The Best Gym in Norwich” has to offer.